This is a great product. I was kinda iffy about buying this on here but did so anyways and I am happy with my purchase. Shipped really fast. 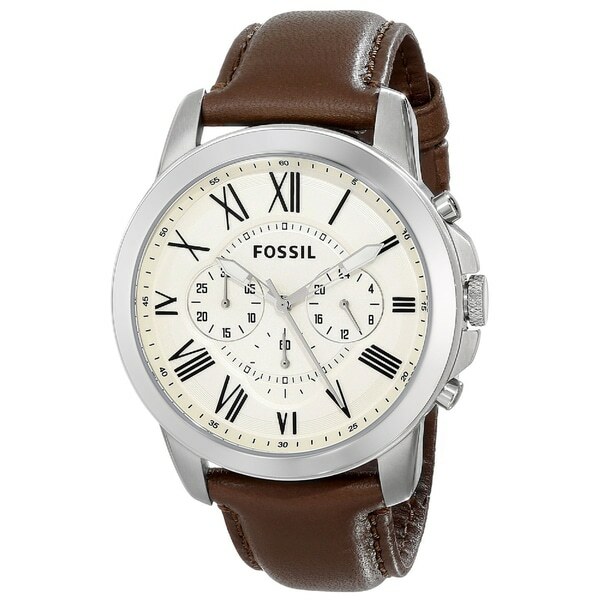 This classic timepiece by Fossil features a stainless steel case and leather strap. A cram chronograph dial, precise quartz movement and a water-resistance level of up to 50 meters finish this fine timepiece. The bold Roman numerals and cream-toned face of this watch evoke the retro style of a classic adventurer. The three subdials track the date, 24-hour time, and seconds up to 60. This timepiece is just as rugged and reliable as it looks, enduring bumps and knocks without scratching or breaking. My brother loved his gift! This watch is very classy and the leather straps add the perfect touch of elegance. There were no problems with packaging, came brand new in a metal case. Bought for my son in law as a birthday gift! He lives watches and did not have one with a leather strap. Nice looking and a great price! This was purchased as a present for my son. He loves the watch...goes with his casual and business look. I would recommend this watch, I always buy Fossil products. This watch is gorgeous! And it should be for the price we paid! We bought it for a family friend who only carries around a 1934 pocket watch, with the similarities we are hoping he will love it. Doesn't look cheap at all and came nicely packaged in an artsy Fossil tin box. I would definitely recommend buying this watch for someone. Even though This is a man's watch, I bought it for myself. I love a watch with a big face. I have received so many compliments on it too. Love the look and was an exceptional value for Fossil. Great watch! Beautiful and good quality. This watch is a great value for the price. I was pleased with the price compared to other watches of this kind. Love this watch. I get compliments all of the time! This watch is both beautiful and has wonderful features. And it looks gorgeous on my fiance! :) Thank you! Purchased for my son for Christmas. Beautiful watch that can be worn as dressy and casual. excellent watch. I love the style. My husband LOVES this watch. He's had the watch a few years now and it is still working great! We have only had to replace the battery. The band still looks good, and everything is working as it should! Great gift. Will order again. This is a very classy and nice watch. "What does the 1 year limited warranty cover?" I like the look, brand and price. "IS THERE A WARRANTY THAT COMES WITH THIS WATCH?" Thank you for your question dpringle11. Yes, there is a 1 year Limited Distributor warranty. Have a great day. What is the Limited explained?